Truckee's Danny Davis airs out of the halfpipe during last year's Dew Tour finals at Breckenridge. Davis will join an all-star cast of snowboarders and skiers in this year's event. Dew Tour is the first top-tier competition of the season, with a roster of more than 150 pro skiers and snowboarders from across the globe — including 75 Olympians. Here’s how they stack up in the trophy case for three major events: Dew Tour, X Games and the Olympics. BRECKENRIDGE, Colo. — The tomato is back in town. For the first time since 2013, when he pulled out of the slopestyle finals, Shaun White will drop into the Dew Tour superpipe when men’s semfinals kick off Thursday at 12:30 p.m. With any luck, he’ll move on to the finals on Saturday afternoon and it’s a position he knows well: At 29 years old, the two-time Olympic gold medalist has been competing in Breckenridge for almost 15 years, nearly as long as fellow superpipe stars like 27-year-old Louie Vito and 32-year-old Kelly Clark. Those three have been fixtures on halfpipe podiums for almost a decade, but this year’s Dew Tour could be different. Actually, it already is. Clark barely eked into the women’s halfpipe final after finishing fifth in the semifinal on Wednesday, and this weekend is White’s first time competing since he took fourth at the Sochi Olympics and another fourth at the 2015 X Games — two uncharacteristic near-misses for the man dubbed “Flying Tomato” by just about everyone when he was dominating the sport for a decade. Now, it could be the youngsters’ turn. There’s 15-year-old Chloe Kim, the 15-year-old phemon who finished third in yesterday’s semifinal and became the youngest competitor ever to win X Games gold. Then there’s Arielle Gold, a 19-year-old Steamboat Springs native who finished first in the semifinal with a whopping 93.40, almost four points higher than China’s Xuetong Cai in second. But then there are White’s fellow heavyweights, snowboarders like Danny Davis, who slid out on the last hit of his 2014 Dew Tour run to miss the podium, and skiers like Gus Kenworthy, Henrik Harlaut and Breck’s own Bobby Brown, all Olympians with a combined 14 medals in three major events (X Games, Dew Tour and Olympics). That’s about six medals fewer than White alone, but who’s counting? Point is, White isn’t the only superstar vying for a medal and early-season glory at Breckenridge. Here’s a look at a few of the rest, plus a few hungry newcomers just itching for their chance in the spotlight. Yes, he’s Arielle Gold’s older brother. And yes, they’re both threats in the superpipe. At 22 years old, Taylor Gold already has one Dew Tour win under his belt, a surprise gold (fitting) at the 2014 event after barely making the finals through the last-chance qualifier. He enters this year’s pipe competition as the reigning champ, with guys like current pipe monster Danny Davis and Breck’s Brett Esser close on his heels. Just look at Esser’s fourth-place run last season: frontside 1260, frontside 1080 and backside 720. Podladtchikov, aka I Pod, has been relatively quiet on the competition circuit since winning halfpipe gold at the 2014 Olympics. But, that doesn’t mean anyone should count him out. This is the guy who invented the Yolo flip, a cab double-cork 1440. Translated into English, the Russian-born Swiss rider can spin four 360s with two inversions, all while riding backwards. He’s never placed at Dew Tour, but he has the talent and sheer guts to dominate. At just 22 years old, McMorris is already a slopestyle machine with three X Games gold medals and one Olympic bronze. The Canadian could have done better in 2014 if it weren’t for a broken rib at X Games, but that hardly stopped him a year later in 2015, when he took gold in Big Air and slopestyle. He’s known for massive air, loads of style and enough attitude to remind people he’s 22. 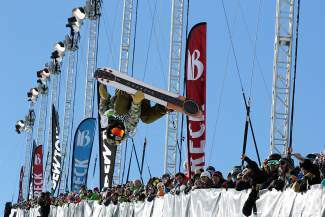 Born and bred in Breck, Willett is one of a half-dozen hometown heroes at X Games. The two-time X Games medalist has a deep bag of tricks on the slopestyle course, including 1080s, 900s in all directions and plenty of inversions. At 27 years old he’s one of the older slopestyle competitors, but it hardly matters. He knows the mountain and knows the course — it’s just a matter it all together. By now, even casual halfpipe fans know who David Wise is. The 25-year-old Reno native seemingly came from nowhere to win gold at X games in 2012 with huge, stylish 1080s and 1260s. But it was just a preview of the Olympics to come, where he took gold in halfpipe with an equally bulletproof run. Wise brings that same level of amplitude and ability to the Dew Tour pipe, where he’s been held winless through his career. Vail Ski and Snowboard Academy is lucky to have a member like Aaron Blunck. At 18 years old, the Colorado native earned a spot on the U.S. Freeskiing halfpipe team in time for the Sochi Olympics, traveling and training with champs like Wise. He didn’t place there, but it hardly matters. The up-and-comer already two years worth of X Games, World Cup and Grand Prix events under his belt (not to mention that Olympic invite), and he’s only getting better. Bowman is easily one of the most decorated athletes on the snow this weekend, male or female. And she’s barely 21 years old. In 2012, the Lake Tahoe native burst onto the scene with a silver medal at X Games. She followed it with a gold in 2013 and another gold in 2014, this time of the Olympic variety. She’s easily a favorite for top-three in the women’s field.